LawLawLaw #43: Technology, Law, Baseball, Rock ‘n’ Roll. My name is Erik Heels, and this is my LawLawLawTM newsletter. Since 2001, LawLawLaw has documented trends in technology, law (mostly patents and trademarks), baseball (mostly Red Sox), and music (mostly rock). Today’s disclaimer du jour of the day: Unauthorized vehicles only. Thanks for reading! Actually, in terms of the typical startup exit timetable (5-8 years), most of Clocktower Law’s clients are still puppies. 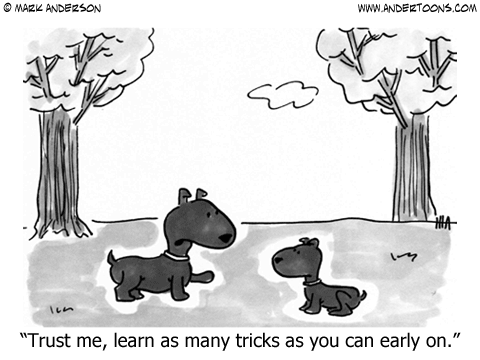 But dogs of all ages can learn new tricks! Want for my builder boy. Richard Feynman (1918-1988) is still teaching us about physics. Clocktower Law names its computers for the (original and best) 64-color Crayola crayons. I correctly predicted that “Dandelion” would be the name “retired” by Crayola, but I’m still using the 1970s list of 64! All old image-only PDFs were re-scanned (electronically) and converted to renderable text PDFs. This makes key documents easier to search and find while also reducing file sizes. This phase covered 90,235 PDFs from the last 10 years (our document retention time limit). This means that Clocktower Law produces/consumes, on average, 45 PDF documents per business day. FWIW. In response to ‘Matal v. Tam’ case below. In related news, some vanity license plates, according to some states, are offensive. “Harmonization” is what broke US patent law (i.e. the AIA), so I fear trademark harmonization. As a result, we continue to recommend filing software patent applications as provisional patent applications, until the courts and USPTO come to their senses. Patent and copyright rights derive from the same clause in the Constitution, yet it is the Patent Office and Trademark Office that have been administrative siblings, while the Copyright Office has lived under the Library of Congress. Putting all three major flavors of IP under one roof just might make sense! The Red Sox are looking good in the dog days of summer! Here’s how the season has gone so far. Here’s how he performed in walk-off situations. When a strikeout is not an out (because every out must end with a catch). Maybe. Rice, Lynn, and Evans were pretty good. The feel-good game of the season (so far). Eck said it felt like a no-hitter. Brian Johnson has publicly struggled with depression, helping many in the process. Not a Sox game, but a great play! I’m including this article because I write self-assessment “digests” monthly for Clocktower Law and have encouraged my children to adopt this habit. P.S. LawLawLaw, available at LawLawLaw.com, is a publication written by Clocktower Law LLC founder Erik J. Heels and published by GiantPeople LLC. The opinions in LawLawLaw do not necessarily reflect the opinions of Clocktower Law, GiantPeople, their employees, or the author. If you don’t share this with friends and family, then who will? Thanks! P.P.S. Erik claims to publish the #1 blog about technology, law, baseball, and rock ‘n’ roll at erikjheels.com. Brevity is not his strong suit.